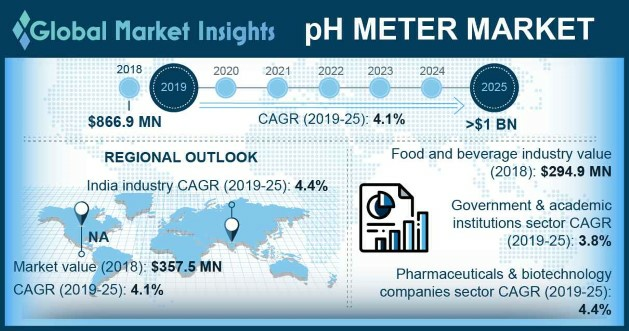 Global pH Meters Market size is set to exceed USD 1 billion By 2025; according to a new research report by Global Market Insights. Upsurge in demand regarding specific and effective technologies for pH meters boosts the industry growth. Technological advancements in pH meters leads to innovative features including calibration free measurement systems, auto temperature and pressure compensation that will augment the demand for pH meters. Also, portable pH meters have wide applications in waste water treatment, bioprocessing, soil monitoring and environment control. Thus, growing use of innovative pH meter will drive the industry growth.